What do you expect more? It's the hottest jazz ticket in the summer of 2008 when the highly-anticipated reunion of the legendary Return to Forever with their best instrumental (because some compositions of their album had vocals as well) line-up: Chick Corea (the Rick Wakeman of contemporary jazz rock), Stanley Clarke (the Tony Levin of jazz rock), Al Di Meola (the Steve Howe of contemporary jazz rock) and Lenny White (the Bill Bruford of contemporary jazz rock). When I had not got the DVD yet I could not imagine how this quartet would perform as I had never seen them on stage even though on video. So I expected them very high and thanks God they really meet my expectation. Two thumbs up. Their performance, overall is flawless. 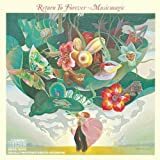 Return To Forever has been phenomeal, at least for me personally. First, I was hooked with the RTF music the first time when I listened to RTF seventh album 'Music Magic' from a cassette owned by my friend sometime in 1976 / 1977. Since then I was curious about RTF and tried to search other albums. 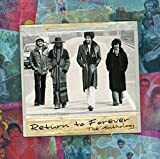 The reason I liked was the composition that was very dynamic, complex but it still maintained excellent harmonies especially with the inventive keyboard work by Chick Corea - one of the founding fathers of RTF. 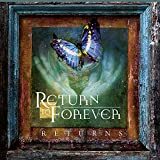 Second, my debut as music reviewer with this wonderful ProgArchives started with writing short review about Return To Forever 'Music Magic' album. It's so memorable to me. Before I had this DVD, I had listened to Chick Corea's 'Touchstone' album where one of the tracks, i.e. 'Compadres' is actually the reunion of RTF with this quartet line-up. 'Compadres' is truly a progressive music composition ant it's a pity that Chick Corea's solo albums are not featured here at this site. It should. Then I got their latest live album 'Returns' which amazed me, really. This DVD also amazes me entirely from start 'til the end. The music is truly brilliant, performed flawlessly by all the members of the quartet. With improvements in both instrument, recording technology as well as members' musical skills after they individually performed solo work and collaborative efforts with other musicians, this performance looks and sounds really great. As Russ Davis wrote on the CD sleeve of the 'Returns', there was a spirit of anticipation for a reunion before the 2008 Tour became a reality. Chick and Al reunited in 2006 to record Al's solo project 'Consequence of Chaos'. Al, Stanley, and Lenny appeared together at the Fourth Annual Stanley Clarke Scholarship Benefit in Hollywood, playing RTF's Grammy winning tune 'No Mysery' with Patrice Rushen in the piano chair. 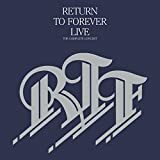 Grabbing some of the best material from the guitar-driven RTF's music from 'Hymn of the Seventh Galaxy' Polydor, 1973) through Romantic Warrior (Columbia, 1976), it capitalizes on individual growth and talent since that time, making this is a wonderful live album. The music flows nicely from the ambient 'Introduction' to the dynamic 'Hymn of the Seventh Galaxy' (3:44) where Meola plays nicely, replacing original guitarist Bill Connors. Most songs featured here are extended from its original recording like you can hear 'Vulcan Worlds' which contains interesting Stanley's dynamic bass guitar solo in the middle of the track. He also plays bass notes from his solo album. It's quite obvious as since the opening part bass guitar has played quite dominant role. The good thing about RTF music is that each musician does not seem to play the instrument as rhythm section. Even though the music contains solo, the other instruments play their roles to fill the music with their own dynamic playing. It happens across all the tracks in this DVD. When Al Di Meola plays his solo, other instruments play dynamically at the back including the jaw-dropping drumwork by Lenny. Chick Corea fills the keyboard in between the solo or sometimes he plays longer solo. You can find similar dynamic collaboration on the next track 'Sorceress' as well. This track is quite unique as after fisrt one minute the music turns into bluesy style featuring guitar solo by Al. It's really great. I thought I would get bored with the extremely extended 'Song to the Pharaoh Kings' which the original version only consumes 14 minutes of duration. But at the end it turned out a wonderful journey of musical enjoyment throughout the span of 27 minutes. In fact before it ends I feel like 'why must it end?' because I still enjoy the music. There are parts where Al plays his guitar wildly combined with inventive keyboard maneuver by Chick. At the what so called rhythm section Stanley plays his bass guitar dynamically. Lenny is very skillful in his changing style of drumming. The beauty of this extended version of 'Song to the Pharaoh Kings' is the fact that each segment of the music, in any portion of the track, provides me with the joy of listening the music. The time when guitar dominates, keyboard creates another dynamic fills that sound like they are making dialogue. The bass lines are also dynamic with great skills of Stanley throughout the song. I really can't believe that with their ages, they still can play solid music and also stage acts as, for example, Chick Corea sometimes play his keyboard set in standing position. Stanley clarke plays hiss bass like he plays cello. Al Di Meola also performs energetically throughout the performance. Lenny plays with high energy and looks very dynamic with his drum stool. Overall, this is a masterpiece of jazz rock fusion live performance. The selection of songs as well as the band's performance are all excellent. On composition, the harmonies and frequency of change of style are masterpiece and backed up by solid structural integrity of each song as well as the whole album I think this is the best jazz rock fusion band and amazing live performance. I can not expect more than this top class performance. What about you? Keep on proggin' ...! Well this is the companion DVD to the live album of the same name, so don't expect my review to differ much from the review I wrote earlier. Actually the DVD was released a few months after the double disc affair, to capitalize on the gullible fans that might be tempted to buy both (I rented both). Needless to say that the DVD offers the added enjoyment of the visual part of the show, even if looking at near-sixty men is not all that much a thrill, apart their hands doing their respective crafts. Seeing the show might even demystify the music, like the percussion solo that Corea executes on his synth, which cheapens a bit the overall experience. Otherwise, the performance is gentle, rather static, but hey, these guys are jazz musicians, not hip-hop artistes. 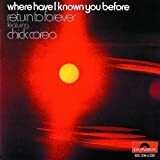 So Chick appears to be the senior member of the quartet and still acts as the band leader and is in prime form, although some of his choices of synth sounds are a bit dated. He plays percussion with a mallet inside his acoustic piano, a little further down the set. Stanley appears to have sustained the decades better than his colleagues and is his usual self with the typical funky slant he's known for, but also puts the bow to the contrabass. Al obviously is concerned with looking younger (he is) than his colleagues and wears dark shades throughout the first part of the show and uses the "unshaven look"; and while he switches guitars a few times, mostly it seems for body colours and lightshow colour- coordination reasons more than musical ones (except for the acoustic one in Milonga Del Angel of course). As for Lenny, he's like Chick, showing his real age and my guess is that he undergoes the tougher toll (drumming is definitely more physically demanding), and it seems Chick bailed him out while he was taking a solo and "got lost" midway through. The only flaw (but that's nothing new with RTF) is the over-emphasis on the virtuoso qualities of each member, sometimes at the expense of the smooth running of the set list. The DVD comes with the US tour footage as bonus, but it's mostly the solo pieces that were already present on the Montreux concert, with the notable exception of the last Jester & tyrant piece from Romantic Warrior. In either case, the two performances are stellar, with the four stars still at the top of their games. My advice is to take the DVD and forget the double Cd version. As Russ Davis writes in the liner notes for this DVD, the reformation and the tour of Return To Forever was THE jazz event of 2008. The American fusion group was active between 1972-78 (plus a brief comeback in 1983 if I understood right), recording a handful of classic albums which, if you ask me and thousands of others, still offer some of the very best instrumental fusion music ever. Yes, the group also made some vocal music with e.g. Flora Purim, but that's not relevant now. The members of this quartet (keyboardist Chick Corea, guitarist Al Di Meola, bassist Stanley Clarke and drummer Lenny White) are legends on their own right, each having made a considerable career outside of RTF as well, naturally. The anticipation under the tour was huge, and the high expectations were truly fulfilled. The concert at Montreux Jazz Festival in Switzerland is excellently captured in sound and vision on this DVD -- which I believe to be one of the best jazz/fusion concert DVD's all-time (well, not that I've seen dozens of them...). The camera work and editing are first class. 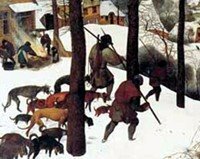 The Montreux concert is approximately 1h 45 min long, consisting basically of six RTF compositions (not counting the short Introduction) plus solo performances of each musician. The most represented albums are Where Have I Known You Before (1974) and Romantic Warrior (1976), and there are the title tracks from Hymn of the Seventh Galaxy (1973) and No Mystery (1975). The quartet does a marvelous job making the compositions come fully alive. They probably sound superior compared to original studio versions. I say probably, since it's been a long while that I listened to the albums. For those not familiar with RTF's music, here are some adjectives: virtuotic, bright, vivant, dynamic, adventurous. The composers on Al Di Meola's acoustic solo are Corea, himself and Astor Piazzolla. Chick Corea's solo contains some percussive use of the piano strings. The theme from the Disney movie Alice in Wonderland (which I actually missed, maybe I wasn't paying full attention at that moment?) is sandwiched between strangely titled '88 + 10 A' and '88 +1'. 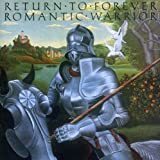 Both Clarke's lengthy and innovatively virtuotic acoustic bass solo and White's powerful if not highly original drum solo are intertwined with an extended version of 'Romantic Warrior' that finishes the show. The DVD contains extras (approx. 45 min.) recorded in the US leg of the 2008 tour. The tracks 'Friendship' and 'Duel of the Jester and The Tyrant' are welcome additions, but unfortunately the whole US footage suffers from not-so-good-looking split screen technique, which started to irritate me a bit. But all in all, if you're looking for top class fusion on DVD, you can't go wrong with this one. Despite the slight disappointment factor of the extras, I consider this release to be on a masterpiece level. 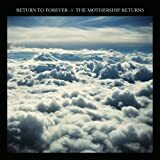 Post a review of RETURN TO FOREVER "Live At Montreux 2008"